Abuja National Stadium: Opened in 2000 Now, it is the home of Nigeria National teams. Capacity: 60,491 all seater with Presidential suite and viewing area. Field: Artificial Turf with video matrix scoreboard and floodlights. Opened 1960 and formerly called Liberty stadium, but renamed in 2010 by President Good luck Jonathan. The stadium host FIFA world Youth Championship 1999. Sometimes, Shooting Stars FC (3SC) play their game in the stadium, but are more at home in Adamasingba stadium. Opened 1992, formerly called Aba township stadium, but was renamed in 2002 as an honor to the club when they won CAF champions League in 2002. The stadium has hosted CAF Champion league finals. Capacity: 25, 000 people with VIP viewing area. Capacity: 25, 000 all seater and a VIP viewing area. Opened 2007 and named after the famous professional footballer from Lagos “Thunder Balogun.” The stadium has hosted FIFA U17 World tournament 2009 and FA cup finals 2011. Now home of First Bank FC. Capacity: 24, 325 with FIFA grade seats (All Seater). Opened 1977 as a 25, 000 capacity stadium, but was in 1999 reduced to 18, 000 capacity to meet FIFA standard. 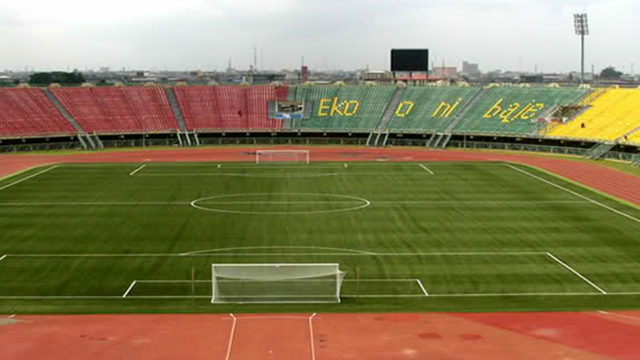 It has hosted FIFA graded games more than any stadium in Nigeria. Now home of Calabar Rovers FC. Field: Well maintained grass turf with ultra modern video matrix scoreboard and floodlights. Opened 1982 and has hosted FIFA U17 World tournament 2009. Now home of Kano Pillars FC. Opened 1985 and has hosted FIFA U17 World Tournament 2009. Now home of Wiki Tourist FC. Capacity: 15, 000 people with a VIP viewing area. Opened 1972 and rebuilt 1999, but was later closed down in 2004. In spite of it’s dilapidation, the stadium remain one great edifice that canmeet FIFA standard with just a little renovations. Now home to Hoodlums and squatters. Capacity: 55, 000 people with VIP viewing area. The Godswill Akpabio International Stadium is an all-seater national sports stadium located in Uyo, the state capital of Akwa Ibom. Abuja national stadium is the biggest stadium in Nigeria while Akwaibom stadium is the most beautiful stadium in Nigeria. Soccer is the worldwide famous sport and millions of people come to see the match in stadium live. Here all the information about the soccer stadium is thoughtful and would like to buy assignment online uk material more about it. Please share the updates about the stadium going to prepare in Qatar for soccer championship.